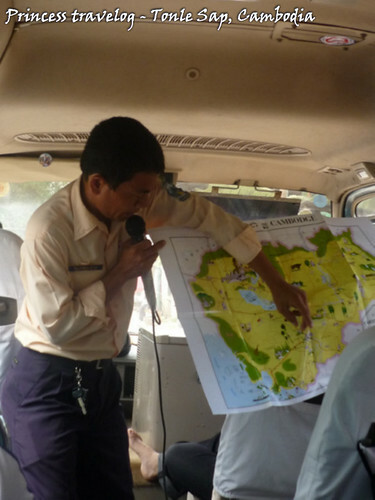 As soon as we hopped into the coach, our guide pulled out a map of Siem Reap and showed us where we were heading to - Tonle Sap. 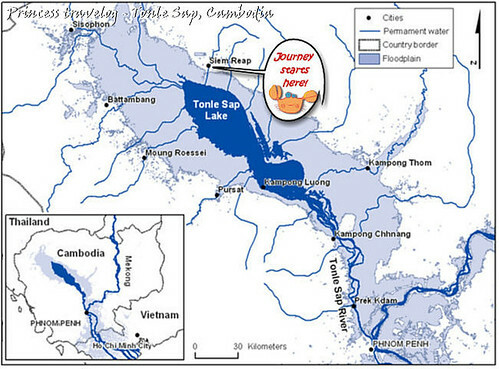 Tonle Sap, meaning "Large Fresh Water River" is a combined lake and river system in Cambodia. During normal season, the surface coverage area is only 2,700 km², but during monsoon season it can increase up to 16,000 km²! If you look at the map below, the floodplain actually covers this whole area during monsoon season. 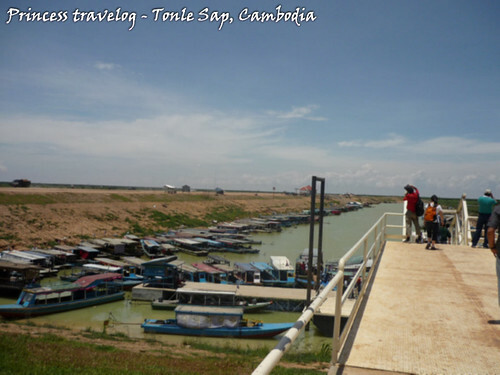 Now that it was the normal season (March) we had to ride a boat from Siem Reap to get to the lake. Weather was extremely hot and the wind was extremely strong. Throughout the trip it seemed that there was never a moment that we didn't sweat. The jetty was full of people, not only just unhired boats. 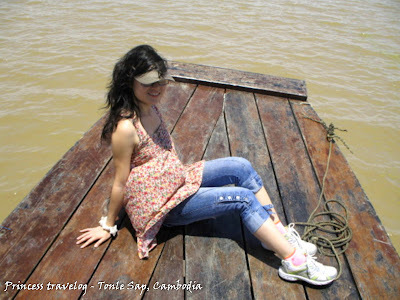 The 45deg steel platform, never wear high heels if you're going to Tonle Sap. Else you'll be walking tip toe unless you take off your shoes. My journey of "awakening" was about to start. Blue sky and muddy river, what a big contrast on the colors. Wind was too strong thus I put on my sun hat. Whenever we lose balance in our mentality, it's always good to go places and see how people live at "the other side of the world", look at them and you'll wake up from the stupid demands that make you struggle. Not to ask you to live the way they live, but learn to appreciate life. We are the one who spoilt our kids in the city, feeding them with luxury since small, dragged them into rat race, competiting each other with no reason. Sometimes I keep asking myself, if I own a 100 things around me, how many of them are "needs" while how many are "extra". And travelling made me think a lot, realizing the strength within each human when we meet difficulty. Many people have lost that, especially the younger generation. What do they know about problem solving? Would you stay here for a day? Floating school, donated by some Korean associations, providing the children with basic need - education. Building them an "indoor" floating basketball court. Here is where the parents (the non-spastic) work. Soaking in the mud everyday looking for 2 meals. 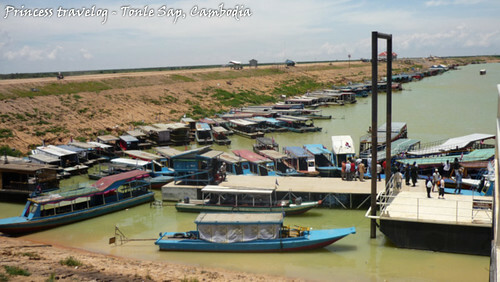 Selling goods to the visitors of Tonle Sap. They know almost nothing about hygiene, yet they are strong and immuned. I believe God always gives a way to live. Life... Different although under the same blue sky. The Korean community donated a lot of buildings to the Cambodian people, including churches. There's no reason that I did not feel the sorrow... I come from the city. But I've learned lessons since my last visit to Sapa, and now Siem Reap. Everywhere in the world has poor people, including our own country. Only we never want to know about it... that is the fear inside us... trying to avoid from knowing what is suffer. You may think I talk craps... But, try to think about it. Ok, back to the trip. 10 more minutes to our destination. This is how the children go to school. Bare footed. And they have to learn swimming (compulsory) before they are allowed to go to school. Must be for their safety. A big boat parked at the river bank. Our group photo - taken with Simon's DSLR. How many cameras and photographers....all from different angles. I think this was shot by Noel as he's the first to climb up to the upper deck. Another one from .... ermm... I can't remember. Simon's masterpiece. 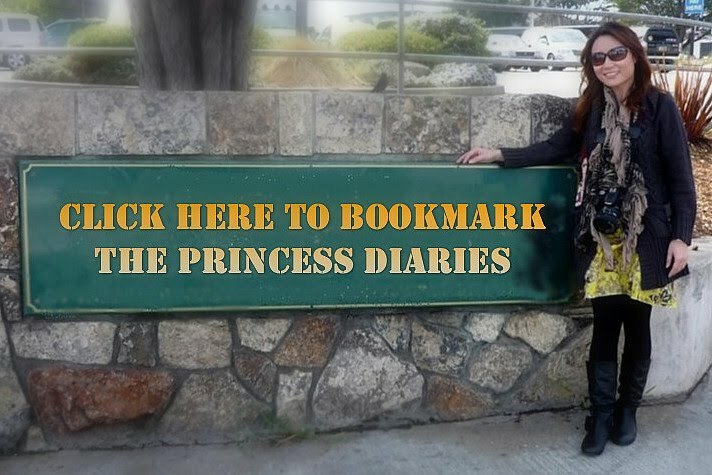 This is actual picture that I wanted, ended up with some 'behind the scenes' photos. I was up at the upper deck too. We're nutz enough to stand right under the sun... at 1pm! Something special for the participants. Having lunch right in the middle of Tonle Sap. It's a boat house. Our event organizer rented 4 or 5 of these. Lotus flowers everywhere. This is a pink one. The living room of the boat house. You know what, the very first thing after we reached the boathouse I asked for was this -- Angkor beer. Anthony was 'forced' to pose like this. ><"
I love Angkor Beer!~ Especially at this hot weather. Muah.... But when I was enjoying my drink, someone as usual, paid a visit to the toilet. Of anxiety. The water of "life". The basic needs of these people. Daily. For washing, for laundry, for bathing... And now we're having our lunch right here at their house. Wignes what do you think? Ya I know... Lotus grows well in mud. Thanks to this fella for the toilet photos..
Now I have to forget about it and start filling up my stomach. Lunch, first dish. Lotus root salad with chicken breast. Food served by Art Iance Cafe Restaurant. The boss, also the chef. Yummy yummy.... just don't think about the water used to clean the kitchen utensils. 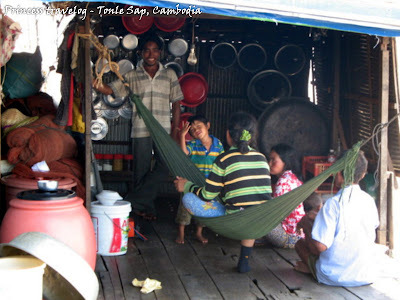 The boss said this was his first time to cook in the middle of Tonle Sap! New experience for him as well. Organizer invited him to come to the boat house and cook for us. Cotton candy and the sticks. Nai didn't enjoy at all... especially after visiting the toilet. Second dish. Vegetarian Angkor springrolls. Don't play play... these chilies are extremely spicy. I had to drink a whole can of Angkor Beer for this! Main dish. Pineapple rice with vegetables and tropical fruits. My favorite white lotus. Quite rare in our country. In Cambodia and Vietnam you can easily get lotus flowers. A pink one, more common. After lunch, the organizer from Dhatu Amazing Race came and distributed the group tags. "Lucky draw" time. We were grouped as "animals". Another 2 hours to race against another 9 groups under the sun. Dhatu Amazing Race! Cool. It's not exactly what you do in the Amazing Race but similar, like you compete against the other teams from station to station. It's 2pm. 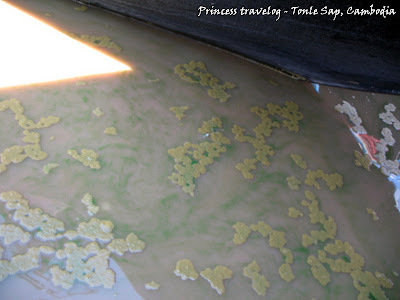 We need to get out of Tonle Sap and continue with the Amazing Race in Tuk Tuk. All members were being separated and formed new groups. Judges after duty. Very relaxing. 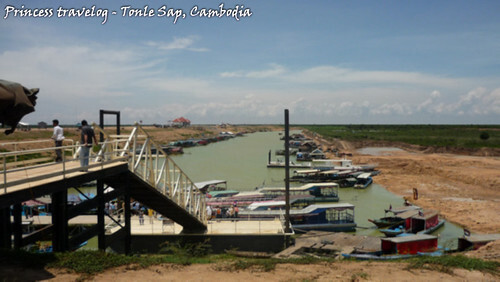 Looking afar, there's another village by the Tonle Sap lake. 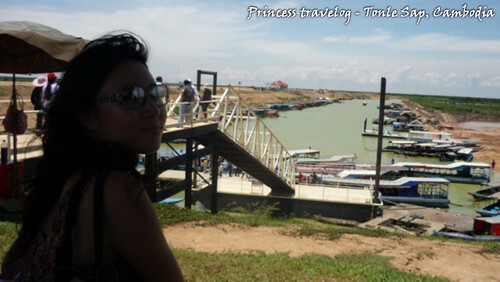 Bye bye Tonle Sap and see you later at the Dhatu Amazing Race! 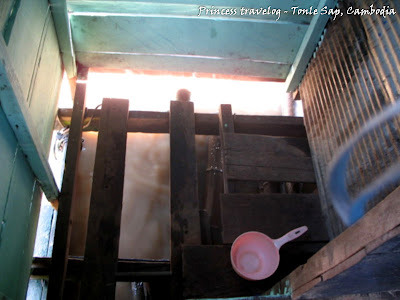 gosh..a real insight to the floating house..i didn't get to be inside of one and the toilet! so were u in a vilager's floating house? or it was a vacant one? A real villager's floating house. 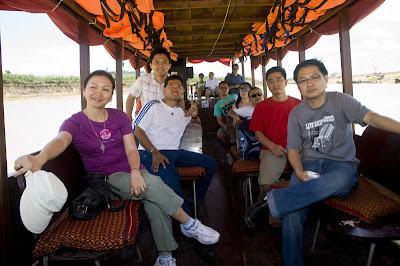 The organizer rented from them for lunch purpose because they wanted to give us such great experience in Siem Reap. The chef said it's his first time to serve his customers away from his restaurant, and also to cook in a floating house.. MidNight posession in front of my house!